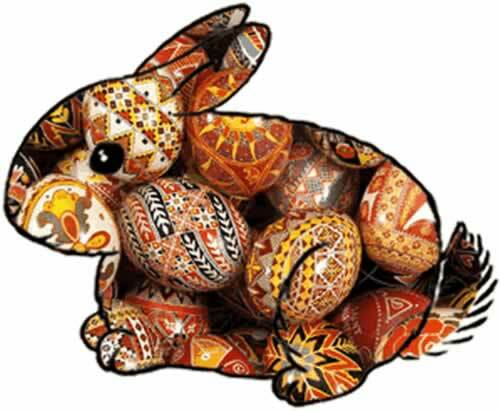 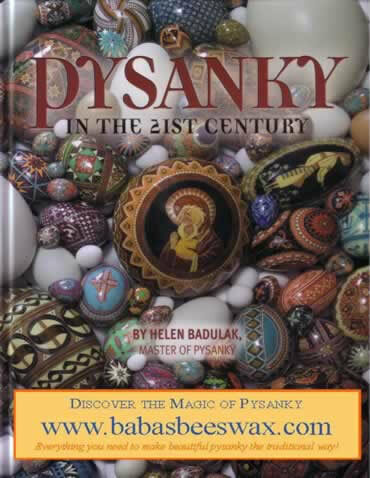 Listen to CBC The Early Edition with Stephen Quinn April 18, 2019 and his interview with Joan Brander about pysanky here. 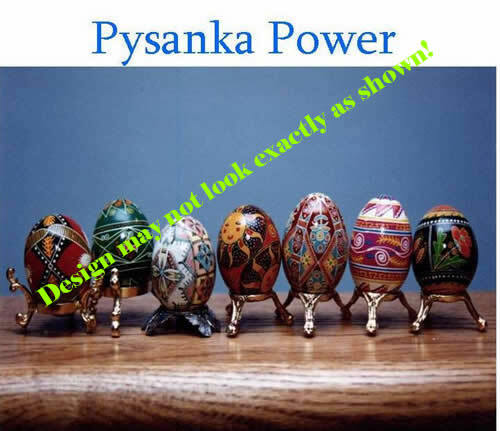 Pysanka Power Podcast by Joan Brander. 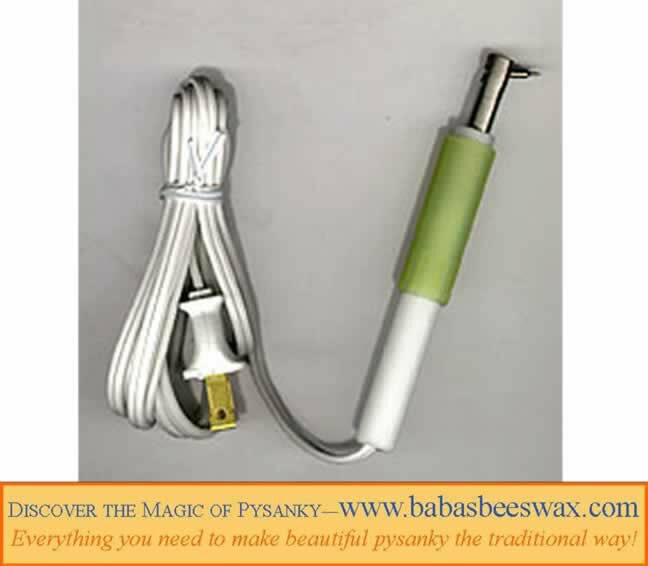 Do you listen to podcasts? 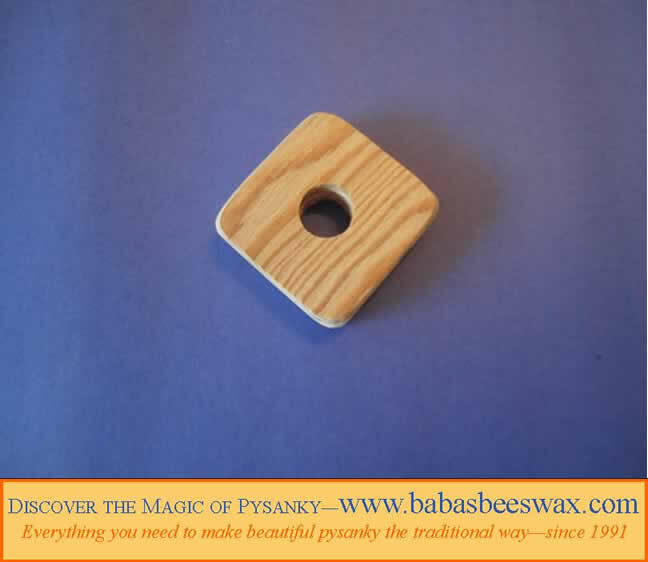 This is a first of-its-kind. 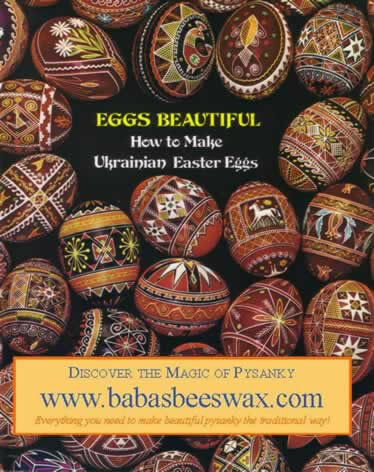 I've amassed so much knowledge and experience about pysanky over several decades since I was a child, I thought that podcasting would be a great way to share my passion. 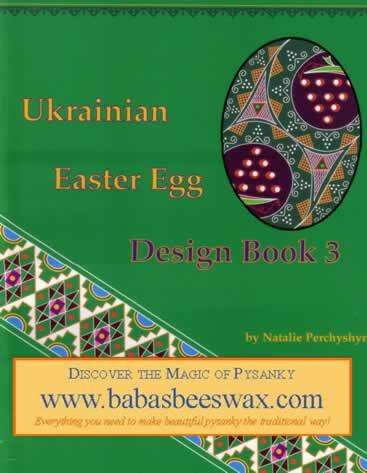 Click on the icon beside any book title on this page to see its format, pages, colourful cover and contents of featured pysanka designs. 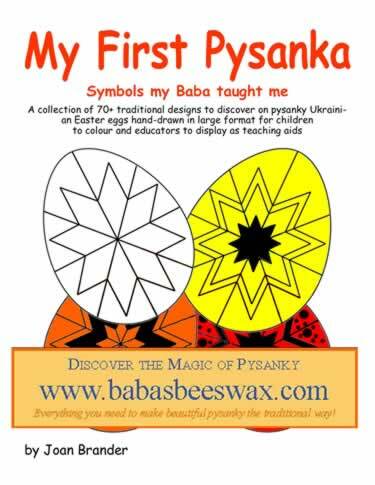 The icon links to the Book Preview Playlist on our YouTube Channel. 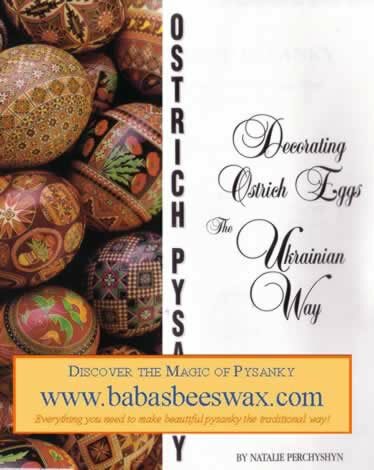 Come back often to see new books and video clips that are added! 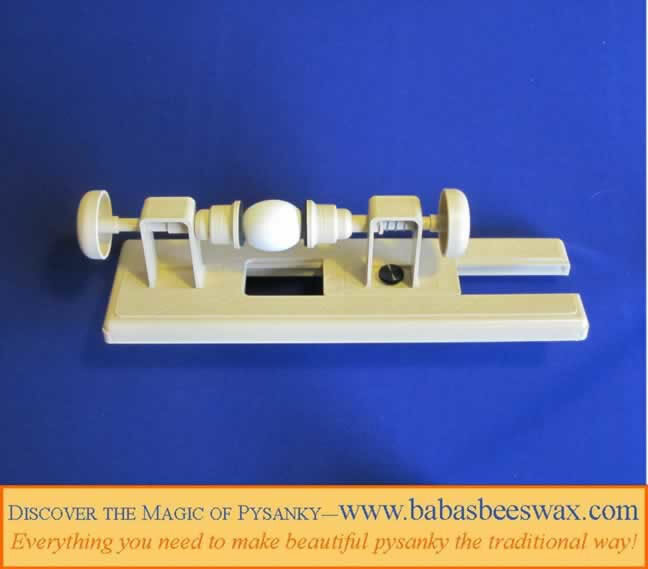 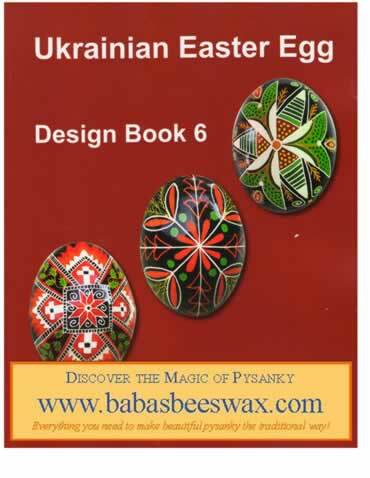 Our team of pysanky experts fabricates and manufactures many of our products. 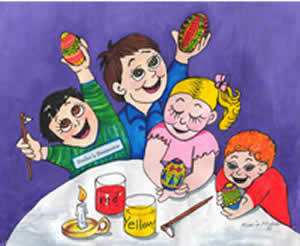 Watch Tom in action in this Pysanka Power Video Clip. 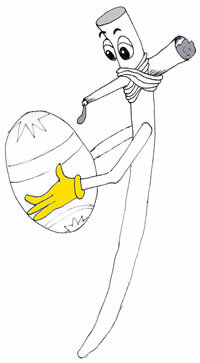 Proudly Canadian, eh? 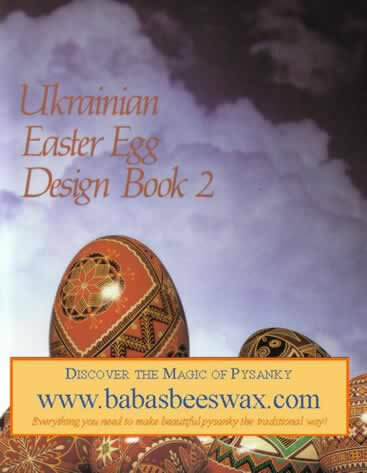 Dirt and debris could be blocking the funnel of your kistka preventing the melted beeswax from writing on your egg smoothly. 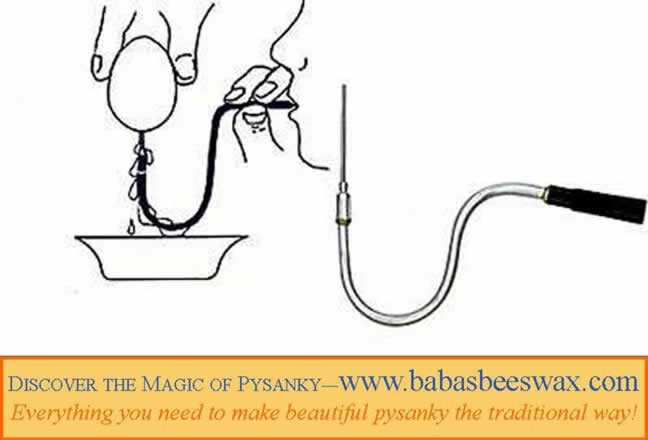 Heat the funnel of your kistka using a candle. 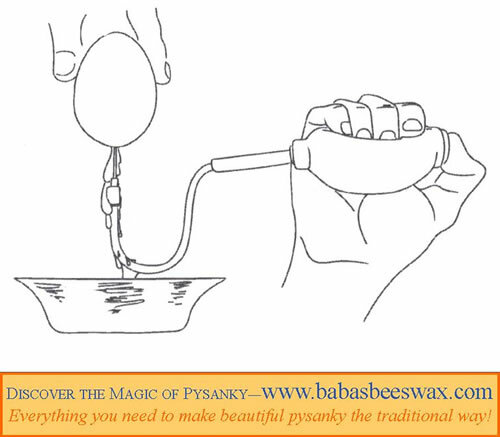 Insert the cleaning wire into the narrow end of the hot funnel. 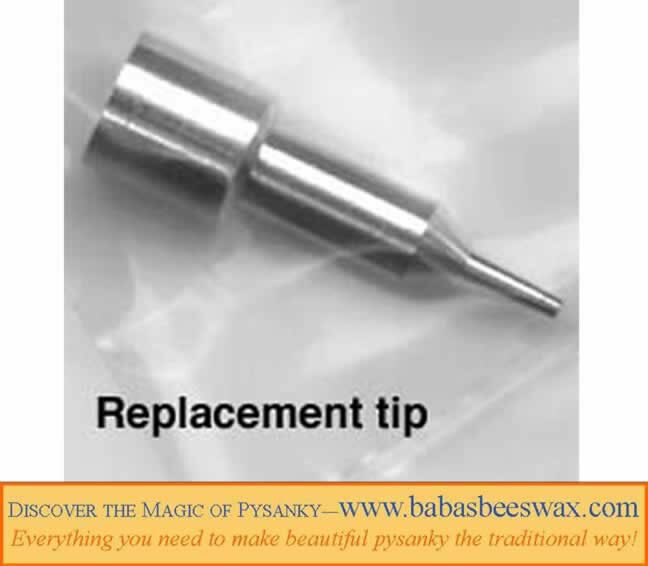 Move the cleaning wire up and down to loosen the debris. 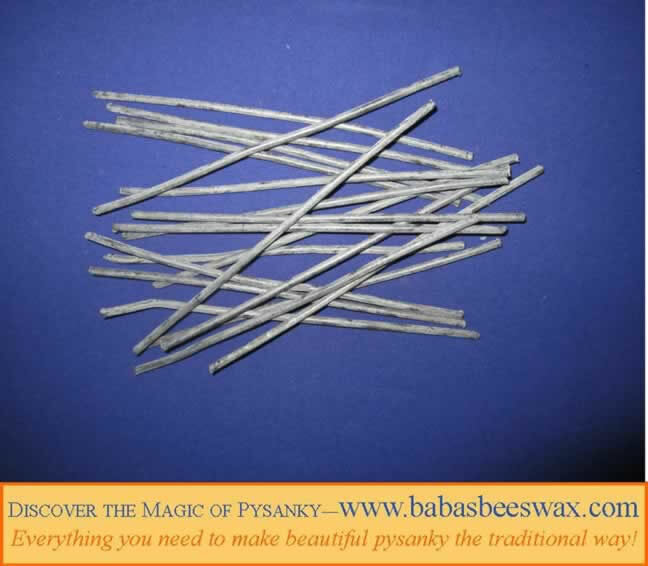 When you bring out the cleaning wire, some of the debris will come out with it. 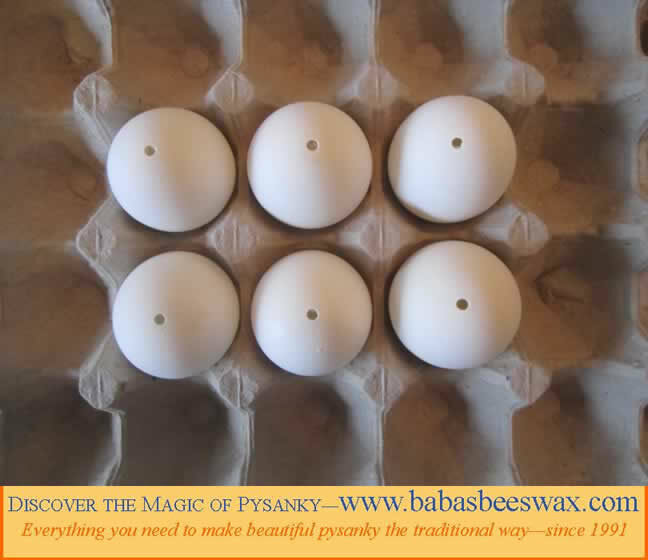 no photo Goose Eggshells - Sold Out. 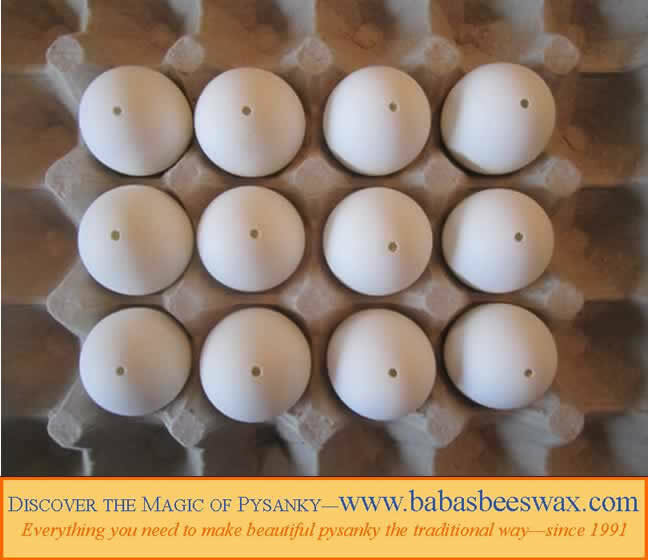 New eggs coming in Spring 2019. 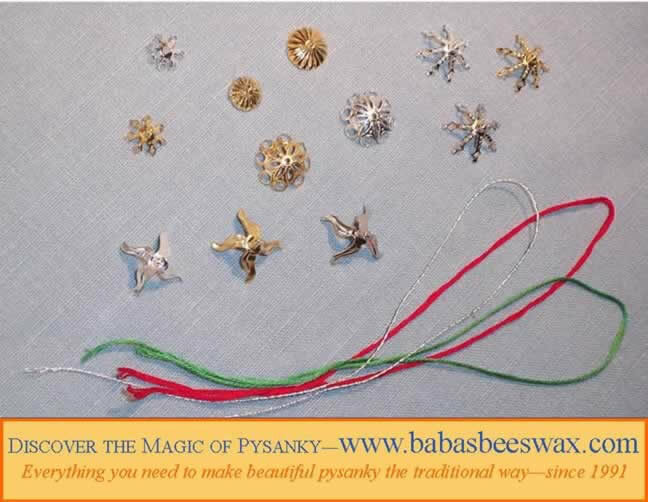 Your dyes can be used from season to season as they will last indefinitely if stored properly. 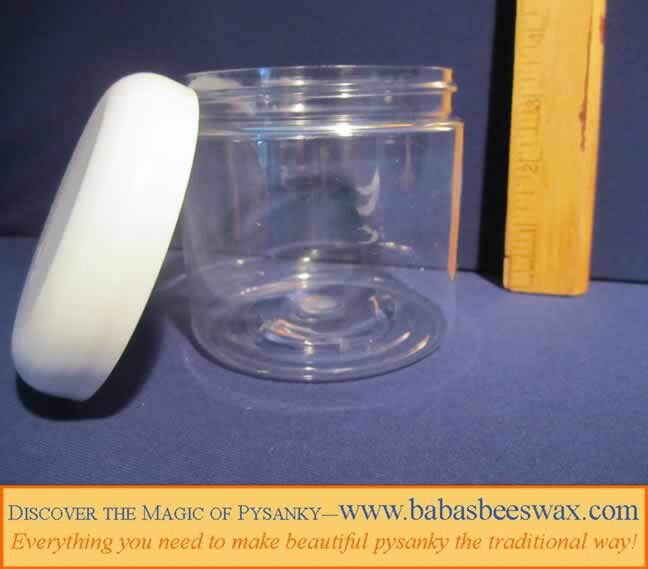 These jars have tight-fitting lids to avoid evaporation. 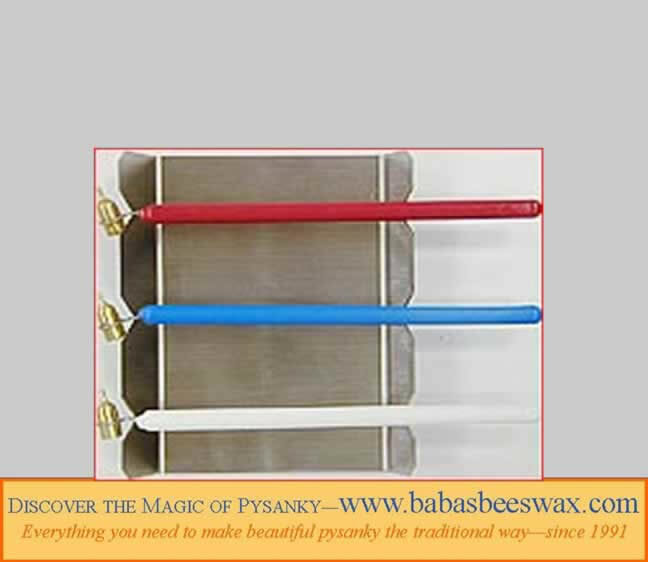 You can freeze your dyes in them when not in use to avoid bacteria growth. 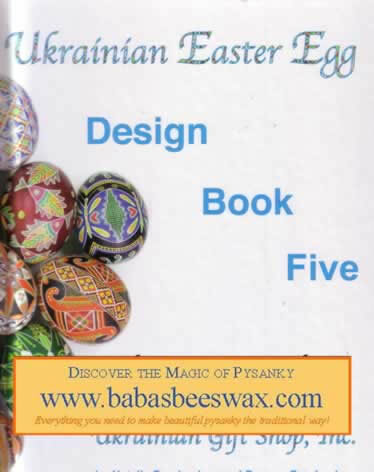 Dirt and debris could be blocking the funnel preventing the melted beeswax from writing on your egg smoothly. 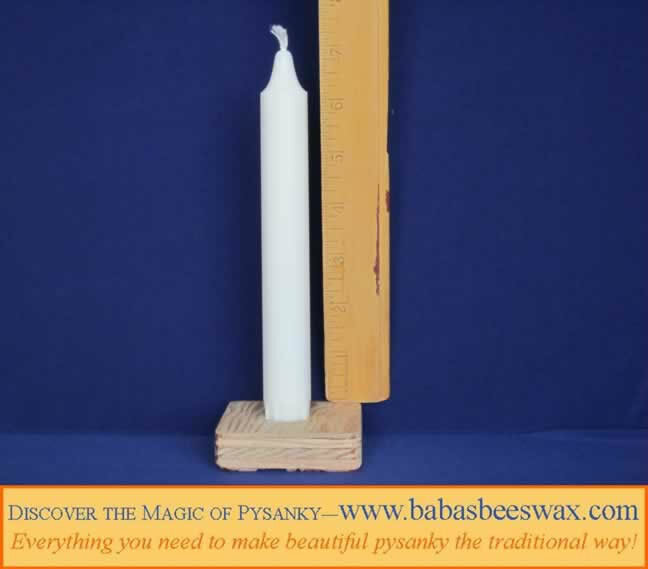 Melt the beeswax like you normally would using a candle. 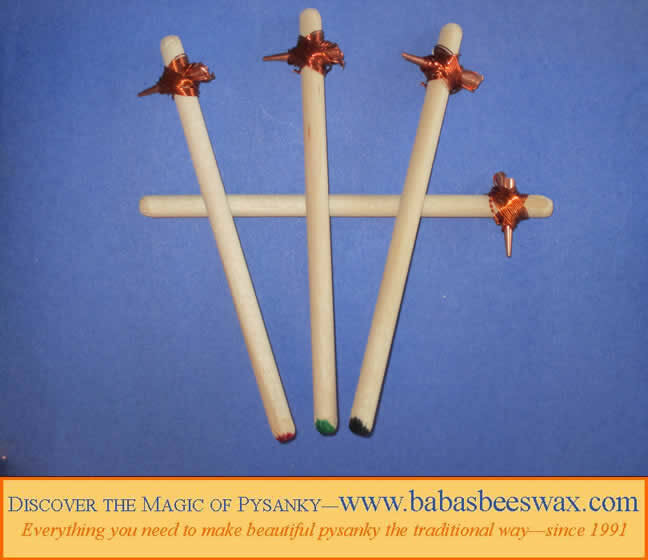 Turn the kistka upside down and give it a sharp strike (whack) on the side of your hand. 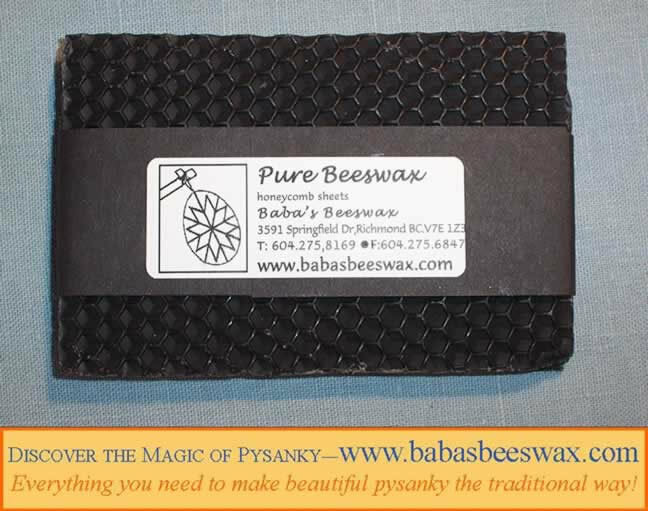 All of the melted beeswax will come out, bringing with it the dirt and debris. 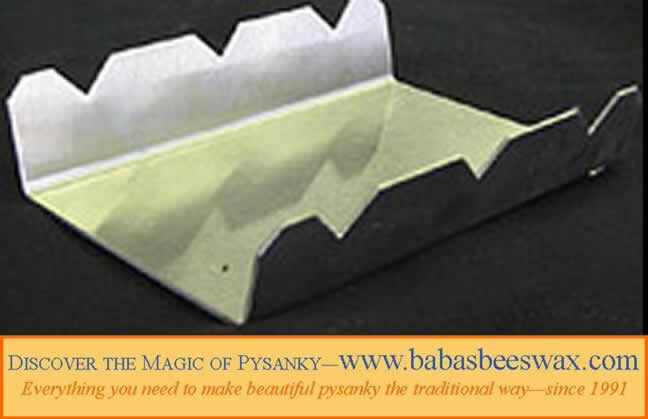 Use a paper towel to protect your working surface. 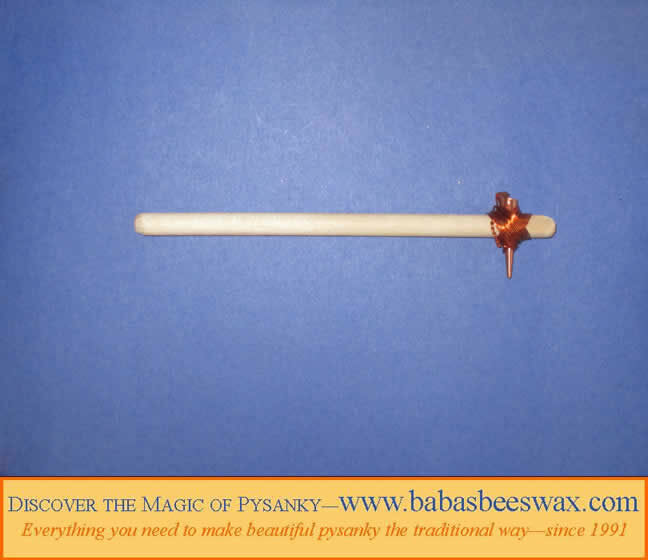 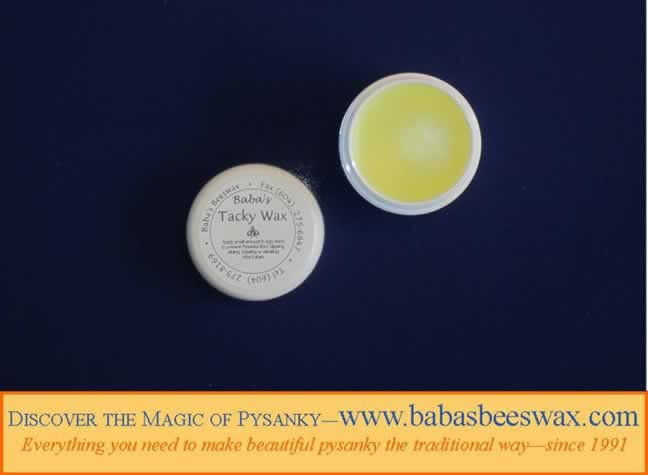 To clean the handle, wipe off melted beeswax with a tissue. 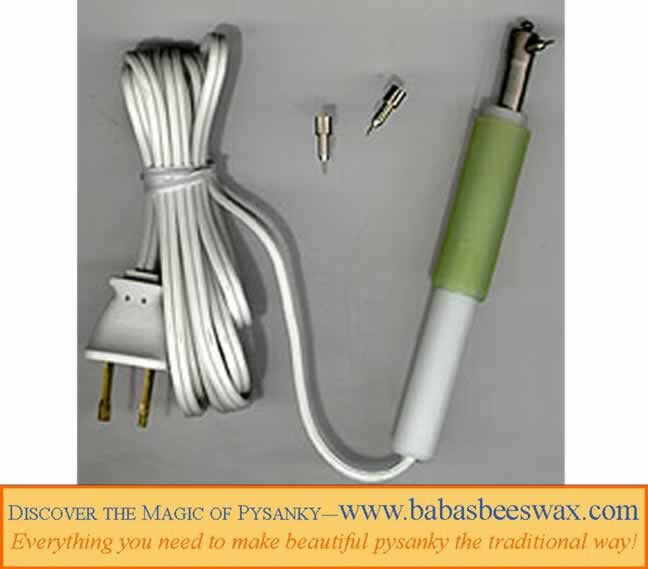 Alternatively, use a cleaning wire to clean the funnell. 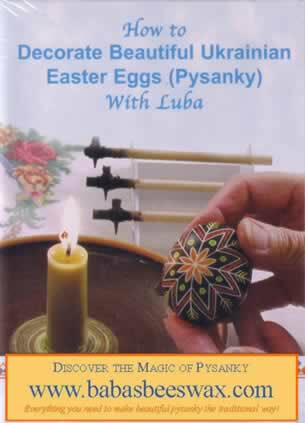 See more in this short video in our YouTube Pysanky How To's and DIY playlist. 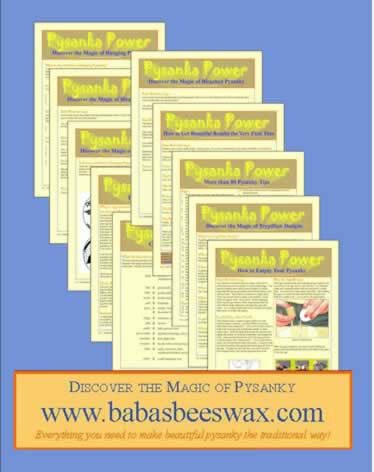 FREE PDF! 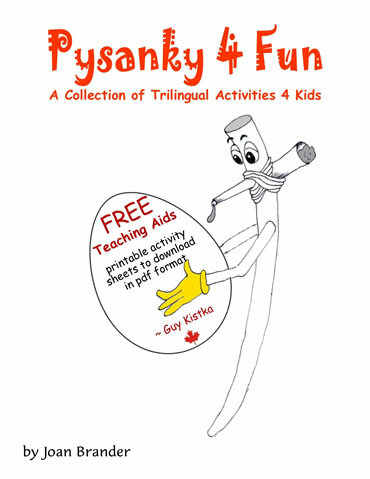 Pysanky 4 Fun : A Collection of Trilingual Activities 4 Kids - A compilation of various trilingual activity sheets created by Joan Brander in one compact publication. 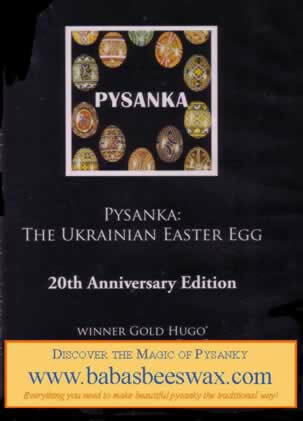 Includes Symbols and Their Meanings (English), On samuse avec Pysanky (French), Pihsahnkih dlya Zadovolennya (Ukrainian), Pysanky Party, Scrambled Pysanky Egg Words, What would Guy Kistka say?, and a Crossword Puzzle. 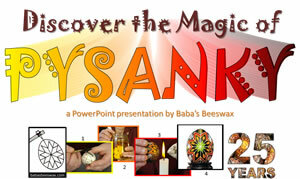 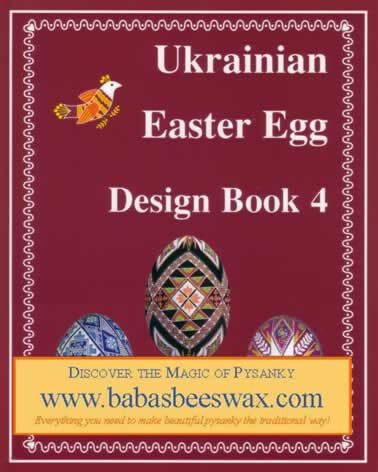 Teachers can photocopy for classroom use to enhance and enliven instruction on pysanky. 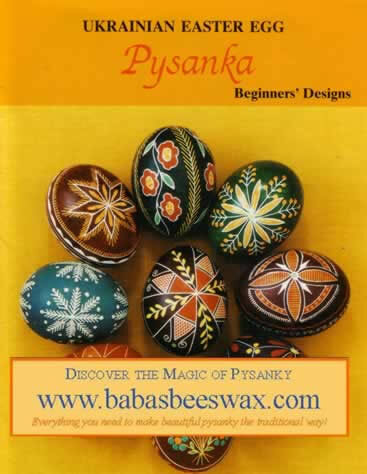 Pysanka Power - useful information, knowledge, hints and money-saving tips covering numerous topics shared by pysanka expert and best-selling author Joan Brander ©2012. 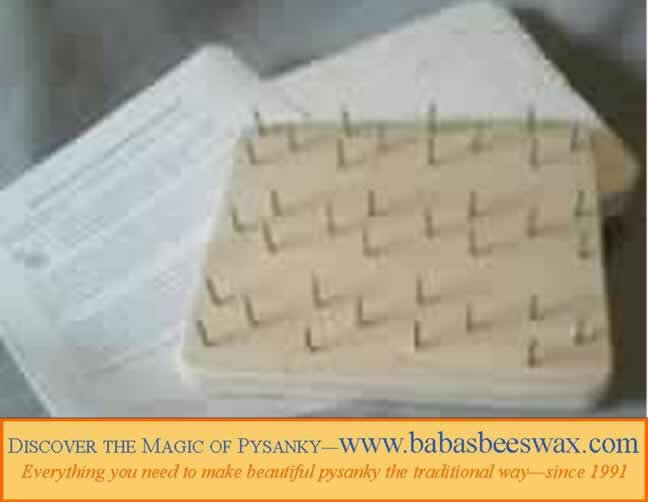 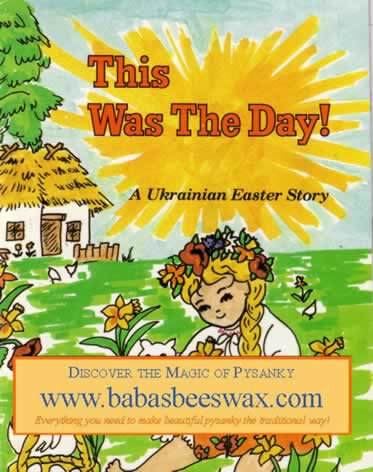 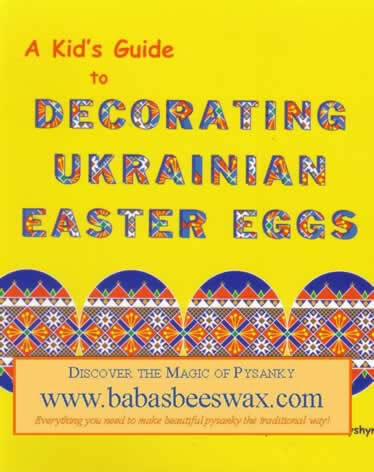 or select this link for information about our eBook Pysanka Power  Writing Eggs with Beeswax and Dyes: Instructions, information, and money saving tips for all levels of experience ©2014 which covers all of the following topics and more . . . .
FREE! 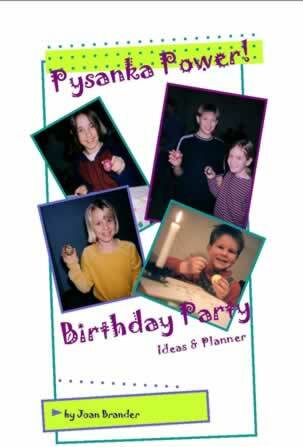 This teaching aid created by Joan Brander compiles various trilingual activity sheets into one compact publication. 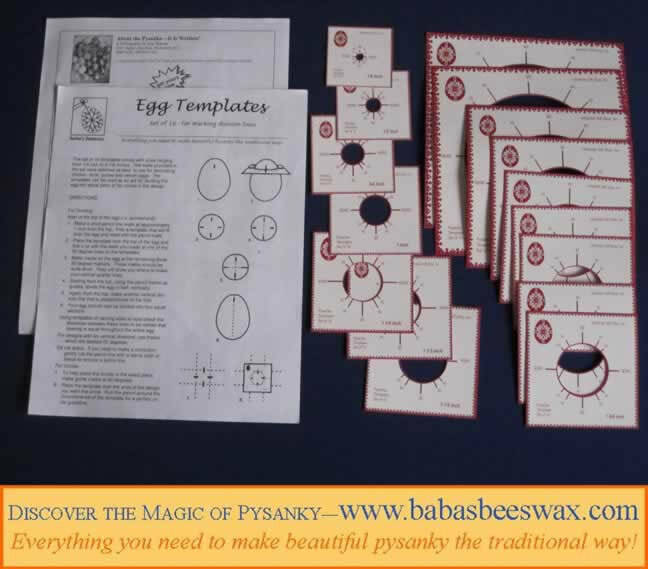 These Activity Sheets were previously downloaded or ordered individually. 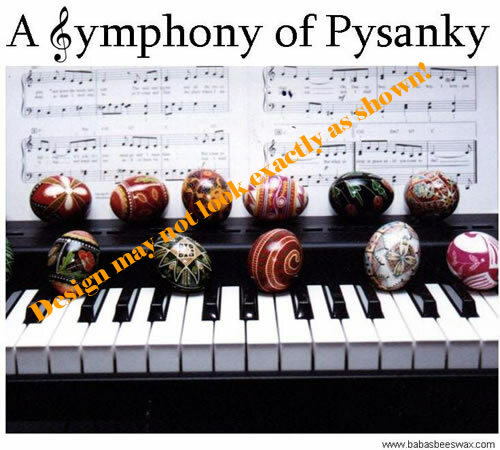 Teachers can photocopy for classroom use to enhance and enliven instruction on pysanky. 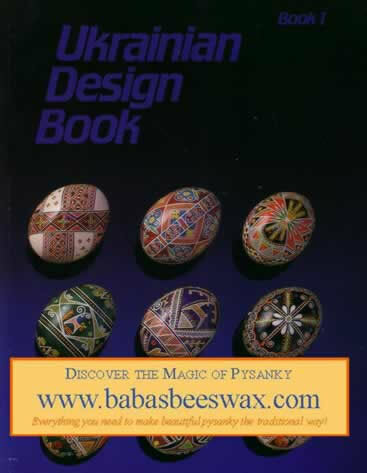 Add to Cart and we'll email it to you. 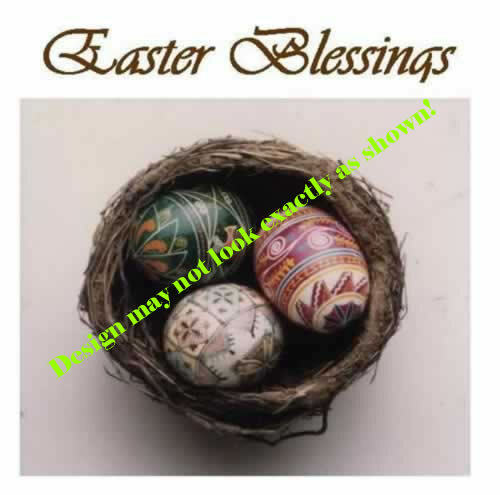 Or Download yourself. 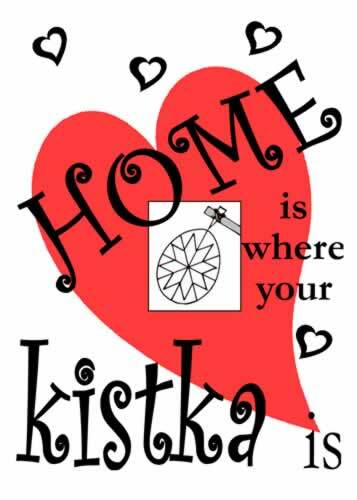 What would Guy Kistka say? 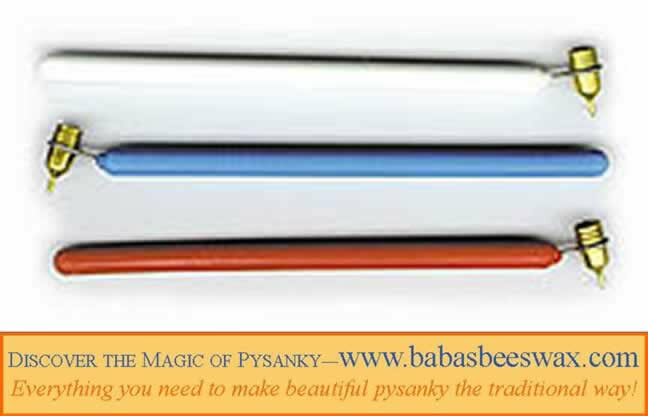 T-Shirts - Only the nicest people wear our Tees. 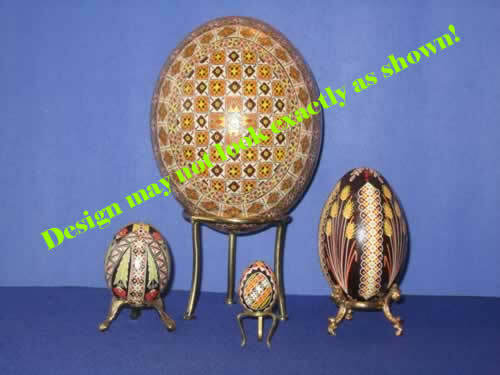 We have 4 styles in 10 unique designs, countless sizes and many colours. 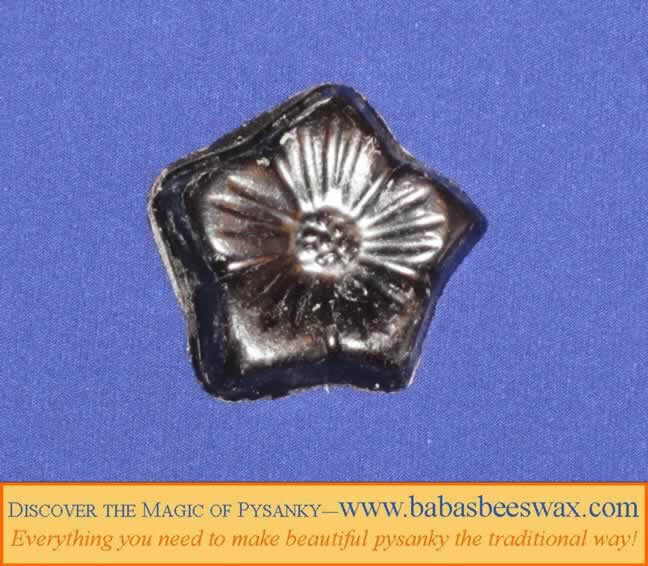 And we're adding other exciting new designs all the time so you'll have to check back often. 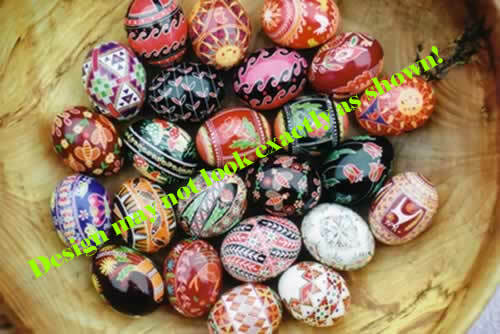 Let us know what you would like to see! 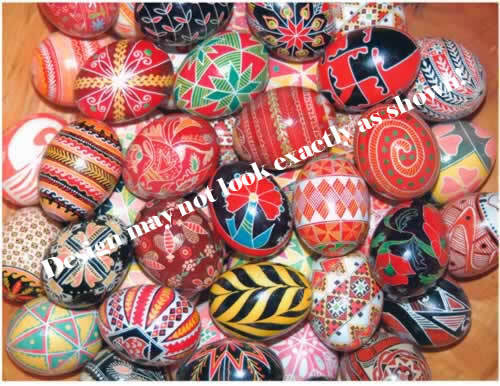 Just askwe may have it in the store room! 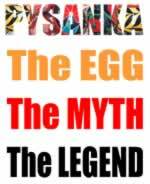 Click here to see our T-Shirt designs. 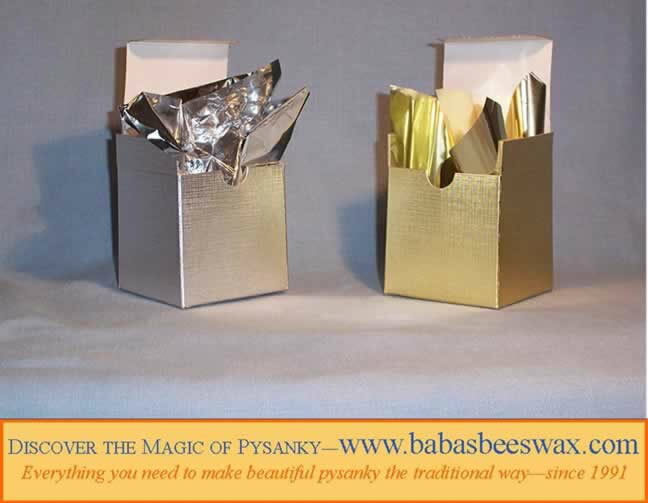 Gift Wrapping Service - we will gift wrap any purchase. 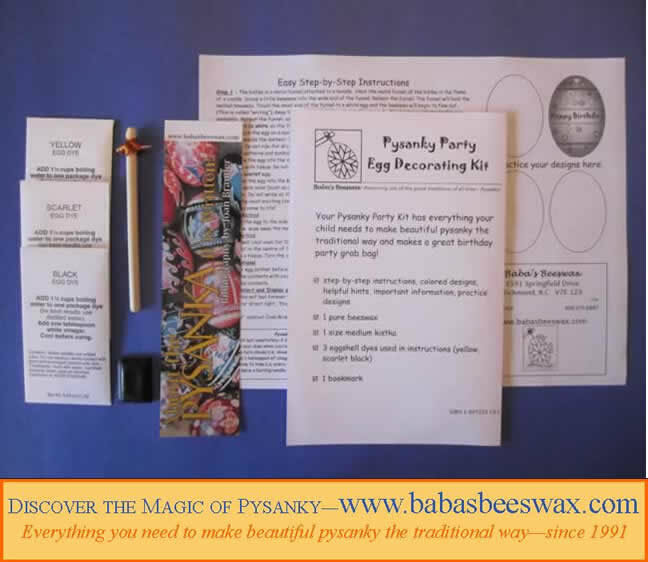 Use the "Notes" section in your online checkout process for personal requests. 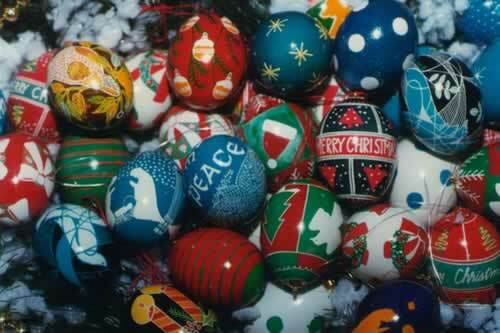 Although we don't have online photos of our wrapping paper, ribbon, tissue and pysanka gift tag, we will email you a photo of your wrapped gift!